The 139th birth anniversary of Father of India, Mahatma Gandhi falls on October 2. Mohandas Karamachand Gandhi was born in October 1869 to Hindu orthodox parents in Borpandar. He was the fourth child in the family, of the merchant caste in Gujarat. His marriage to Kasturbai took place when he was a child. Child marriage though misunderstood and ridiculed and now legally banned had its own value then. Gandhis father who was Prime Minister of a small princely State sent him to England to study Law. Although he was mediocre in school he was resolute in his ways. Gandhi passed the matriculation examination in 1887 at the age of 18 and with the financial assistance of his brother proceeded to England and having passed his law finals was called to the Bar in England on June 10, 1891 and was enroled as a Barrister in the High Court of England. There is a question remaining unanswered about Mahatma Gandhi’s life. Was he a born leader or did time thrust it upon him? Due to the humiliation, sufferings and oppression he and his countrymen were subjected to by British Imperialists he became resolute in his stand to free India from the yoke of English hegemony. Gandhi appeared on the political scene in 1915 adoringly and reverentially hailed as the Father of the Nation. He played a very important and crucial role in India attaining independence in August 1947. The briefless Barrister as he was once called at the time of his journey to South Africa he had a special role to play in the country. He was impressed with our national leaders, their integrity and political acumen. Gandhi was much surprised of our nations yearning for freedom through non violent means and to relieve the country from imperialist oppressions. He returned to India at a time when the country in general and the Indian National Congress in particular needed very much his valued guidance, wise counsel and astute leadership. He did not fail the party nor the country. Gandhi was saturated with the best that was in Hinduism, and he gave life to some of the teachings that were buried in the Vedas. His great Hindu spirit cut its way through the forest of words meaningless words, which had overlaid the golden truth that was in the vedas. He made some of the words in the vedas yield a meaning to which the men of his generation were strangers, and he found in India the most congenial soil. In the 1920’s Mahatma Gandhi proclaimed himself a Buddhist saying that Buddhism was rooted in Hinduism and represented its essence. Mahatma Gandhi visited Sri Lanka in 1927 as an honoured guest of our land and had no hesitation in declaring that he was a Buddhist because he saw Buddhism as cleansed Hinduism. In a speech at the YMBA Gandhi said that what Buddha had done was to introduce a living reformation in the petrified faith that surrounded him. Mahatma Gandhi was one who tortured himself physically through fasts to off set the sinister plans of the Britishers to continue their dominance over the Indians. As a leader until the bullets from the assassin gun snatched his life he led India alone. He unified the diverse forces in India into one. He rescued the Indians from the clutchess of British slavery and gave them a new lease of life. In a speech delivered at the renowned Buddhist Vidyodaya university in Colombo, Gandhi said that it was his deliberate opinion that the essential parts of the teachings of the Buddha formed an integral part of Hinduism. By his immense sacrifice, by his great renunciation and the immaculate purity of his life he left behind an indelible impress upon Hinduism, so Gandhi said of the Buddha and Hinduism owes an eternal gratitude to that great teacher, he said. By visiting Sri Lanka Gandhi felt a profound respect for its people and admired the scenic beauty of the landscape. He was impressed with our national leaders, their integrity and political acumen. Gandhi was much surprised of our nations yearning for freedom through non violent means and to relieve the country from imperialist oppressions. Perhaps he may have felt jealous of the Sri Lankan peasantry as they were much informed and educated on matters of importance unlike the Indian peasantry. Gandhi admired their literacy, their keen intention to raise productivity to satisfy the local needs and the aspirations of the people. Gandhi said, It is my fixed opinion that Buddhism or rather the teachings of the Buddha found its full fruition in India and it could not be otherwise for Gautama was himself a Hindu of Hindus. Gandhi led a life of purity. He was a saint in his own way. Simple living and high thinking were the true hall marks of his life. Though he is no more in his mortal frame his spirit howers all over the mountains, valleys and fields. He remains the guardian angel of India particularly to those downtrodden the oppressed and the depressed. His spirit continues to govern and lead the men of his generation of politicians and that is why India has not disintegrated. Gandhi decried the pervasive drinking habit in Sri Lanka especially among the poor and said that it was opposed to the spirit of all religions most decidedly Buddhism. This was said during the contemplative era of the Temperance movement in Ceylon. Gandhi further said that he did not know what the position in Sri Lanka was but he knew that in Burma the Buddhists would not kill animals. On November 19th 1927 visiting Badulla Gandhi said that he was pained to hear that even some Buddhists observed the curse of untouchability and that untouchable women were forbidden to wear upper garments. If you believe in untouchability you totally deny the teaching of the Buddha, said Gandhi. On June 22nd 1927 addressing the Ceylon National Congress Gandhi deplored the way communalism was being promoted in Sri Lanka. Gandhi was disturbed by the deep rooted Westernisation that he saw in Sri Lanka and said that it should be eschewed because it created divisions among the people. In a speech at Mahinda college Galle Gandhi said that he was certain that the children of the nation who receive instruction in a tongue other than their own commits suicide. It robs them of their birth right, he said. In a speech delivered at a meeting of Indians in Jaffna Gandhi said that he wished Sri Lanka would be an improved version of India which had fallen on bad times. Sri Lanka should be the model for India. Gandhi resolved to destroy white supremacy. He was determined to drive the whites out of India. He demonstrated an extraordinary patience and tolerance towards all the inhuman degrading and at times cruel treatment meted out to him and his followers by the English masters. 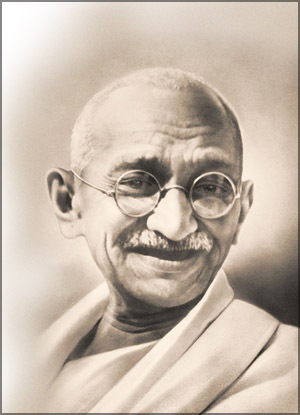 Mahatma Gandhi adopted non violence as the means to achieve peace. At the beginning even most of the Indians could not agree with him. Britishers ridiculed his approach. They never knew that Dharma was more powerful than their guns and bullets. Gandhi left the shores of Sri Lanka after his much honoured visit a changed man in thought regarding India’s Southern neighbour Sri Lanka. His departing sentiments as all Sri Lankans learned were; communalism is totally opposed to nationalism. Sri Lanka would never get genuine self government unless all the communities speak with one voice and not merely as Christians, Muslims, Buddhists, Hindus, Sinhalese, Tamils and Malays. On January 30, 1948 just two days before Sri Lanka received Independence from the British rule Gandhi who preached non violence as his weapon to achieve freedom from the shackles of colonial masters to India was shot dead by Nathuram Vinayak godse a religious fanatic. Not only the whole of India but also neighbouring Sri Lanka felt grief at the snatching away of this great soul the Mahatma whose life did inspire and influence many of our Asian leaders and our country and our leaders.